Boda bodas riders (file photo). A Dar es Salaam-based Acclavia Insurance Brokers has unveiled an insurance package that covers 'bodaboda' riders and their passengers against accident. Acclavia Executive Director, Mr Ancelimi Mushi said about 500 bodaboda riders in Dar es Salaam are set to benefit from the Life and Permanent disabilities insurance by Acclavia through its 'Boda Salama' project. 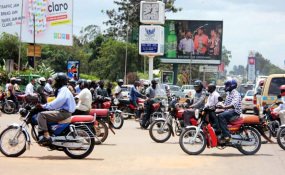 The member will be compensated with two new motorcycles and 500,000/- cash when he/she loses a body part, he said adding in case of a principal member's death, two motorcycles will be given to the family, plus 1.5m/-. When the patients cannot pay the bill the institution bears the burden of the unpaid bills. "We receive patients sometimes in unconscious state and we must treat them as per our roles and responsibilities. When they wake up already fixed with an implant to the affected organ and tell us they are unable to clear the bill it becomes our burden," he said. He hailed government efforts towards plans to introduce universal health cover, saying the move will solve challenges they face.